Back row (left to right): Steve Rickerby; Mick O'Shaughnessy; Andy Tucker; Mark Hutton; Lee Shailer; Lawrence Marsh. Front row (left to right): Chris Garrett; Ferenc Morath; Shaun Dooley; Phil Baker; Darren Nicolas. This was away to Worthing Supporters', earlier this season. And here are a few images from the game away to Worthing Supporters' which was played back at Easter, on Good Friday morning. The first image is the changing room building in the corner of the park, run down inside, but looking rather quainter than inner-city London park pitch facilities! Marvellous news for the SUMMER TOUR! As you will all be aware we are going back to Tallinn, in Estonia, at the end of July to play our good friends from JK Jalgpallihaigla. We have been also been trying to broaden our horizons, and go into 'unchartered territory' for us, by taking the boat over to Helsinki, in Finland, on the Sunday, and hoping to arrange a game over there. After much to & froing via emails, not the easiest thing to do when we speak no Finnish, but thankfully they speak English, we are proud to have arranged, and honoured they have accepted, a Supporters' game with the fans of one of their top sides HJK Helsinki! I received an email from one of their number, Vellu, to accept our offer of a game! They have their own website here; with a messageboard, which has a posting on our game you can join in with, apparently a lot of them speak good English, here. Then look at the 'Muut Asiat' section for the post on our match. The actual kick of time and venue have still to be confirmed, as they are in the process of trying to book a pitch, but in the evening we will be able to cheer on their 'big boys' as HJK have a 6.30pm kick off at home at their Finnair Stadium, in a Finland League First Division clash with IFK Mariehamn, who I must confess, I've not heard of before! It is with great disappointment that I write to you to announce that the Wealdstone FC Supporters Tournament, originally scheduled for this coming Bank Holiday Monday - will not be happening this year due to 'unforeseen circumstances'. Please accept my apologies if this has caused any inconvenience to you or your players. We hope to be able to host it at a later date, possibly later in the summer or more likely next season. May I wish you good luck for the coming season and a prosperous summer. Ladyboys lack the balls to win! It was a confident Phil Baker, one of our own, but also of Ladywell FC, the self-styled Ladyboys, who turned up at Mottingham, hoping for their first ever victory against ‘The Rabblers’. But once again, it was not to be! This match was originally set for January, prior to our trip to Namur, in Belgium; & their annual tour to Bolgna, Italy. But for reasons only known to himself he simply forgot to book the pitch & had to cancel at short notice. Rumour had it he was running scared of facing us again. But he was charitably offered another chance by our management duo, which he proceeded to build up for the weeks preceeding it. Billing it as his own personal ‘European Super Cup’ between his two sides, with a number of continental excursions under their belts across the Channel. In fact it wouldn’t be untrue to say that there were some in ‘The Rabblers’ camp who were a trifle apprehensive about the match, as losing to the ‘Ladyboys’ was inconceivable. Not the actual loss, but for him having ‘bragging rights’ for the foreseeable future. Matters weren’t helped for us with five players crying off, for a variety of reasons, in the twenty four hours leading up to this match. In fact at kick off time there were only nine of us, and Mishi Morath was ‘pressganged’ into playing, having only turned up to take photos and watch the match. Luckily it was on an all weather pitch, so he could play in his trainers, and there was enough spare kit in the bag! It didn’t look good for us when we were a goal down after less than a minute, by the time Andy Tucker arrived, having been unavoidably delayed, we had equalised. And we gradually took control, but the game to’d and fro’d as the goals rained in. But throughout the match we continued to gift them goals. And miss some that were ‘easier to score’! biggest ‘culprit’ for us was James O’Shaugnessy, who still managed to bag a hat-trick! Lawrence Marsh also scored one, but the most honourable mention in the goalscoring stakes was a player who made his debut in out first ever match nineteen years ago, at the old Champion Hill Stadium, & has been part of the team ever since. Step forward Mishi Morath, whose somewhat exhuberant celebrations can be forgiven by the simple fact this was his FIRST EVER GOAL for ‘The Rabblers’! That was the strike that put us four three ahead, and it seemed to knock the stuffing out of the Ladywell team. We scored once more, before they rallied, to pull a late one back, but too little, too late as we kept up, and extended our unbeaten record against the ‘Ladyboys’, perhaps not quite as good as they are talked up to be, when old Big nose has a gallon of ale inside his belly! The team voted on Mishi as man of the match, fitting for his goal and tireless running, even if it had little effect (! ); but mention must also go to Shaun Dooley, who had a sterling game in goal between the sticks, making a number of top notch saves to keep us in the match; following the almost non-arrival of Amin Haque, who strolled up midway through the second half, and was reduced to a ‘bit part’ for the opposition, making up the numbers for them. Also an honourable mention in Hamlet dispatches to 58 year old Mark Hutton, ‘enduring’ a rare full ninety minute run out, who despite tiring in the latter stages, never stopped battling. Oh what might have been for the Ladyboys, never mind no ringers from AFC Wimbledon ,who they've used in previous defeats against us, not even their biggest admirer would have helped them today! ‘The Rabblers’: Shaun Dooley; Mark Hutton; Steve Rickerby; Danny King; Mick O’Shaughnessy; James O’Shaughnessy; Lawrence Marsh; Ferenc Morath; Mishi Morath; Ian Gannon & Andy Tucker. Scorers: James O’Shaughnessy (3); Lawrence Marsh; Mishi Morath. When you play football simply for the enjoyment it’s an oft used cliché that “the result doesn’t matter”; or to nick an Olympian phrase “It’s not the winning, but the taking part that matters”. But in the early afternoon of Sunday 11th May that really was the case, despite it sounding like ‘empty words’ as “The Rabblers” went down by eight goals to two against an XI from the Old Westminster Citizens Football Club. For the occasion was no 'ordinary' game. This was a benefit match for the family of their late player Stephen Benjamin, who collapsed and subsequently died while turning out for them on January 5th, earlier this year. Despite the sadness of his death this was in no way a mournful affair, as it was more a celebration of his life, and a day that he would really have enjoyed, which I’m sure he did, looking down from the ‘great football ground in the sky’. It was clear from the start that the Citizens were the more organised of the two sides, many being members of the actual side that Stephen played for. We were well beaten by the final whistle, but it didn’t matter. We rotated a large squad, with a number of players making their debuts, all making a financial contribution to the day, by paying our larger than usual ‘match fees’, with every penny raised going to his family. This was helped by programme sales on the day, kindly written, compiled, printed & collated by Andy tucker; who was also instrumental in arranging to get the use of the Champion Hill Stadium facilities free of charge from the Football Club. For which we offer a big than you both to him, and Ian Gannon, for all their sterling work in arranging the whole event. Also thank you to Dulwich Hamlet Football Club owner Nick McCormack & Football Committee Chairman Jack Payne for waiving the pitch hire charges, especially with the Club needing every penny it can raise to keep its head above water. A wonderful gesture from them. The game itself? Well to be honest that was an irrelevance, the only thing you need to know was that everyone really enjoyed themselves. Ok, not quite the only thing. We were honoured to have in our line-up the First Team manager Craig Edwards. As if that wasn’t enough he brought along two actual genuine First Team players in Stanley Muguo & Daryl Plummer. This is the first time we have had the pleasure of actual Dulwich Hamlet First Team players appearing for us, & whilst it was funny to see them both on the bench for the Supporters’ Team at one stage, as in ‘how low can their Hamlet careers sink after that!, it was an amazing gesture from all three. And one that will be appreciated and talked about by us all for many years to come! It was fitting that Stanley scored one of our goals, a long distance effort from at least thirty yards. With our other being rather spectacular too. James O’Shaughnessy hitting a volley from just inside the edge of the box, a strike that wouldn’t have looked out of place if it had been in an actual First Team match itself! Paul Verrico made his belated debut for us, at the ‘young age’ of 54; & will be turning out again. Welcome on board Paul! At the other end of the scale young Richard Strivens pulled on our stripes for the first time, a mere whippersnapper at fifteen! Which will bring down our average age somewhat! Though that could go shooting back up if he can ever persuade his uncle, ‘Linesman’ Ian. Not known by that moniker because he’s a qualified official, but because of his constant haranguing of the assistant referees at Hamlet First Team matches from his preferred spot along the side, at home games. We’re halfway there in getting him to play, possibly!, as we he did volunteer for ninety minutes against the Citizens, but only as he man in the middle with the whistle! And making his first appearance for a couple of years was Amin Haque between the sticks, turning the clock back, to remind us how far he always was down the pecking order in the goalkeeping stakes! And finally we can’t forget another ‘guest player for us. With ten minutes on the clock Andy Tucker who swapped sides with Citizen Jock Henderson. A nice touch, at first glance, but what really made it was the fact that Jock made his debut for them in 1953! No, that’s not a typing error, and he is a sprightly seventy two years of age! And somewhat ashamedly he was fitter than a number of those wearing our colours who he joined! He has, thus, become the oldest person to pull on a Dulwich Hamlet Supporters’ Team shirt, in our nineteen year history. Easily eclipsing our current ‘spring chicken’ 58 years young Mark Hutton, who must now estend his playing career for us by another fifteen years to reclaim that accolade! After the game we retired to the boardroom for a few well earned drinks, as the bar was booked out for a function. Stephen’s family said a few humbling and moving words, which rounded off a fitting day in his memory. Hopefully this will help cement links between our two clubs, which can continue for years to come. By all accounts Stephen Benjamin was an extremely special, well loved & much respected person. It’s easy to see how he fitted in so well with the Old Westminster Citizens, if the players & friends he left behind are anything to judge by. ‘The Rabblers’: Amin Haque; Craig Edwards; Stanley Muguo; Daryl Plummer; Andy Tucker; Ian Gannon; Jon Surtees; Dave Yuill; Dawn Taylor; Ferenc Morath; Steve Rickerby; Chris Tabrett; Richard Strivens; Darren Nicolas; Paul Verrico; Shaun Dooley. Click here to see the excellent album of photos taken by Paul Griffin of the match. I am writing on behalf of the Benjamin family to thank you for making Sunday 11th May such a tremendously memorable occasion. We feel honoured that such a venue should have been chosen to host matches in Stephen’s memory and highly privileged to have witnessed such a high standard of play. The match between Dulwich Hamlet Supporters and Old Westminster was an exciting and entertaining game. You gave a good account of yourselves, with purposeful play and well executed goals. Although the final outcome was not in your favour, your enthusiasm and determination was truly admirable and a real delight to watch. I should also like to thank your supporters for their encouragement on the day. As a family, we miss Stephen terribly but gain a great deal of comfort from having the opportunity to experience the sport that he so loved. Sunday was therefore very poignant to us and I want to thank you for your unreserved participation and support. I apologise to members to whom I did not get a chance to speak in person as this letter cannot fully convey how uplifted we were by the occasion. Thank you all for your genuine regard and for providing such a wonderful event in Stephen’s memory. Bring on our, now annual, thumping by the cricket team of the 'Hayes Lane Ultras', which is the Bromley supporters' football team. This will be the third fixture, and we've lost comfortably both times! It's a 20/20 fixture, and our 'ambition' is amybe not to be good enough to win (beyond our dreams, I fear!) but maybe to conclude our twenty overs for the first time! It's on Thursday 5th June at the same venue as the last two summers, which is the Metrogas Sportsground in New Eltham, an east ten minute stroll from New Eltham station. The first ball will be prompt at 6.00pm, and there is a nice bar on site. If you'd like to turn our for "The Rabblers" with bat, instead of the more traditional ball, then email Mick at mospurley@hotmail.com to let him know. You don't have to have played in previous years, nor have turned out for the football team, selection is open to all Dulwich Hamlet fans. Don't worry if you've got a big nose, it will fit under a helmet! But everyone enjoyed it, which is the whole point really! 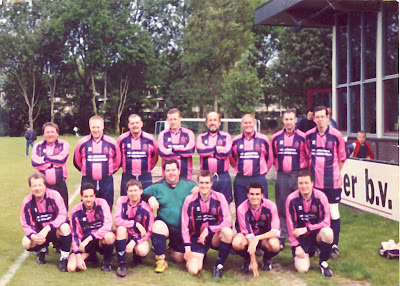 This photo was taken at the Amsterdam tournament in May 2002, which was our first ever trip abroad. I can't remember who the opposition were off the top of my head, though I do recall we lost all four of our group games 2-0, and came bottom of the group! I must have the names of the teams we played at home with the tournament programme somewhere, but where it actually is would be anyone's guess! Back row (left to right): Mishi Morath; Dave Berry; Ian Wright; Steve Rickerby; Mark Hutton; Dave Penny; Gary Austin; Paul Griffin. Front row (left to right): Phil Baker; Paul Vinnell; Rob Pemberton; Matt Hammond; Damon Green; Lucas Green; Phil Doyle. Also on tour party, non-playing, not in photo: Lawrence Marsh. Gary Austin & Rob Pemberton were 'guest players' for us. Gary is the brother of former Hamlet fan Jane, and he lives in The Haque, in Holland, and came to Amsterdam for the day to play for us. Rob was a work colleague of Larry. If anyone else from this tour party have any old photos lying around at home I'd love to borrow them to look at, and maybe copy some for here. My snaps were lost, as I was a 'bit worse for wear', and I lost my camera somewhere over there. Just as well I finally stopped drinking after this tour! Summer's here...remember the last one? Last July saw "The Rabblers" go to Estonia for the first time, taking on our now good friends from JK Jalgpallihaigla, when we lost by the somewhat unusual score of 10-6! I took lots of snaps at the time, which I saved to disk, but didn't have the 'know how' to publish, being a complete technophobe! Now that I am getting aquainted to using my own computer, & believe me it is a slow process, Paul Griffin & Andy Tucker are kindly helping me to learn how to use it. Over the next few months,as I get to grips with this, I will slowly start to publish old photos that I have snapped on here. These are the ones I took last July, to hopefully get you in the mood for our return to Tallinn at the end of July, in just over two months time. A couple of miles from the Old Town, in the centre at Hotel Stroomi. This was the 'view' from my room! fitting, as we're in the shadow of the Hamlet First Team! Keep up man, keep up! such positioning from him too! back at home in south-east London! Ha! The fools! That got me out of the hot sun! "They think it's all over! It is now!" in the Boardroom at Champion Hill Stadium! For he's a jolly good keeper! Matt appreciates his gift from our hosts. it's six goal star Larry! well it's better than his Tottenham one! "Gissa job, gissa job! I wanna run the side! Ah beer! Alright kitboy will do..."
You can't take him anywhere!